Home » Crafting » Jars » Custom Mothers Day Gifts: Trio of Tutorials! Custom Mothers Day Gifts: Trio of Tutorials! 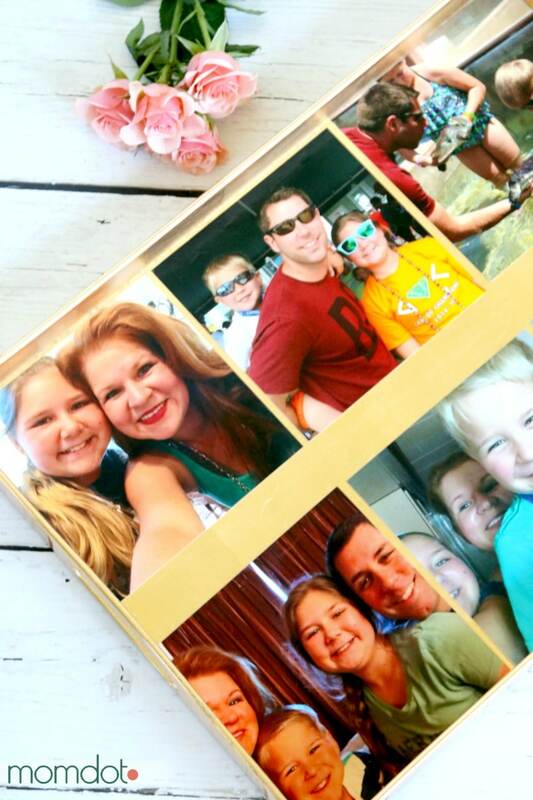 It’s Mothers Day this weekend and if you feel like you have yet to grab mom something, whether that is your mom or you are someone looking for a mom in your life (kids, spouse, etc), I have a really fun DIY craft that you can turn into a meaningful, beautiful and customizable present. Let’s get real- Mom loves presents and it’s fine to buy her whatever her heart desires, but adding something homemade is like the heart of mother hood. I know that I have every mothers day card that has ever been handed to me since my kids were born stuffed away in a chest. There is just something about those little drawings or heart felt written “I love you’s” that brings what we are celebrating to the core. Today I want to premise these two tutorials by saying that while the result is gorgeous and look like they take a long time to make, they don’t. It’s super easy. 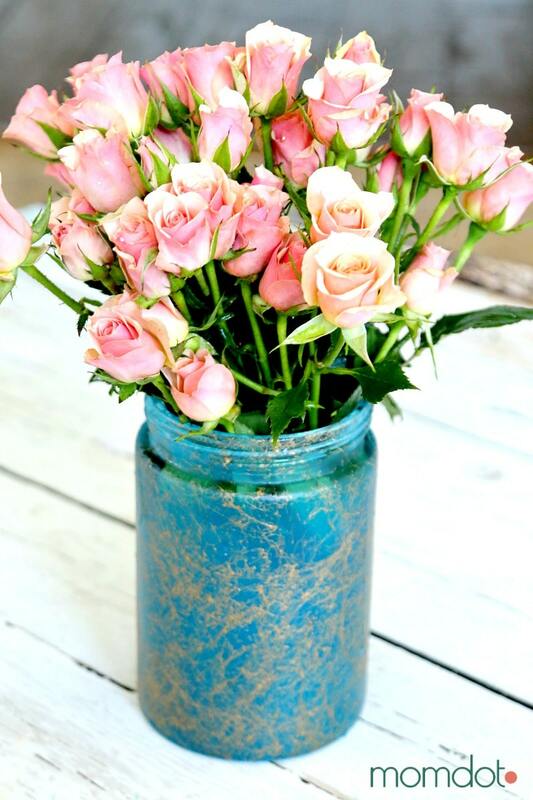 First, let’s get started on making mom a vase or mason jar flower holder, which is the first part of our gift. You can always go out and buy one to start (Hobby Lobby, Micheals, Walmart, Dollar Tree) but truthfully your house likely has about 15 vases stuffed under a cupboard somewhere. Just pull one of those out. As long as its glass and has nothing else on it, you can use any design at all and this is a great way to repurpose them into something showy. Second you will need SEAGLASS and MARBELIZING spray paint. See Marbelizing Spray! Its amazing! Likely you do not have these in the house but they are super easy to find. About $8 a can, I picked mine up at Hobby Lobby. You can also grab one of their coupons off their webpage to knock it 40% off. I am sure that Home Improvement stores carry them as well. They come in a variety of colors and I used the Aqua Sea Glass spray and the Gold Marbelizing spray. 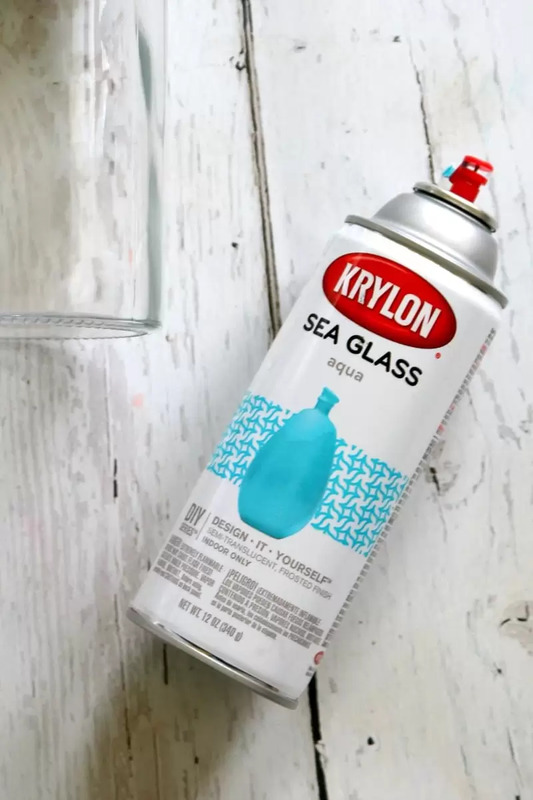 Take your vase/jar outside and carefully coat your glass in even sprays of the sea glass paint. This will take all of 3 minutes. You may want to use gloves because I did get some back spray on my hands. Now set aside to dry about 15 minutes. The result? Gorgeous. Then use Marbelizing spray to spruce it up and make it look expensive and creative. Check out this short video I made of it in action. It’s pretty darn cool. I can see a lot more of this in my future. Just wipe off the wispy spray strands around the lid. Once dry, add flowers to it! But this is only PART of moms gift! Now let’s get down to the personalization stuff. In my house, I am really good at not only taking pictures with me in it, but also taking tons (and printing tons) of pictures. CVS and I are partnered to show you how you can easily and quickly and SAME DAY get images to do tutorials like this without waiting. You simply head to CVS, upload your photos (you can do this on the mobile app too) and send over to the Same Day pick up photo printing store. Then they print them, email you that it’s done, and you swing by and pick up. When I went to do this particular craft yesterday, I uploaded some images from our recent family vacation, chose my size (8×8- which is a neat box print) and had them in my hand by 10:30 am. That made getting this craft done to show you a great present idea, EASY. And it will also make you DOING IT easy. And don’t forget, when picking out photos for projects, MOM should be in them too! Moms, if you are reading this, make sure you are in photos as well. Originally I wasn’t sure what kind of craft I wanted to show off to you. After all, photos make some beautiful presents on their own, that I almost hate to add them to anything. But when I brought home these 8×8 images and sat them on my table, I realized how PERFECTLY they fit in this random gold tray I had. It was like it was meant to be. We all have them – like random pieces of kitchen supplies that ended up here for who knows why and this was one of mine. It was a free gift in the mail really. 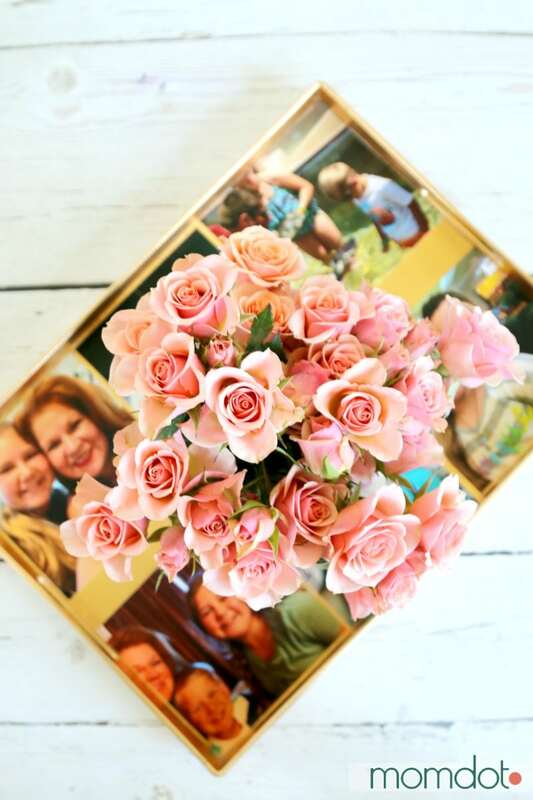 A photo tray is such a beautiful gift and can be used to display, to deliver mom her Mothers day Breakfast or to put as a centerpiece in the table. Simply brush the back of your photos with modge podge and lay inside tray. Allow to dry about 15 minutes. Then brush your modge podge over the entire tray. This will harden the image. Now you have to let this “cure” for 4 weeks technically. But it will dry to touch in a few hours, sometimes less. SO it’s perfectly giftable in a few hours time. I made mine yesterday and its totally dry right now. Just in modge podge world..I guess it needs another 3 weeks and 6 days before you spill water on it. Fair enough. My only tip here is that if you use a cheap paintbrush, the bristles can come out int he modge podge and dry into the tray. Which is what hapepned to me. So use a really good paintbrush or a sponge. Love ideas like these? Make sure you are on my list for free printables or following my Pinterest account.